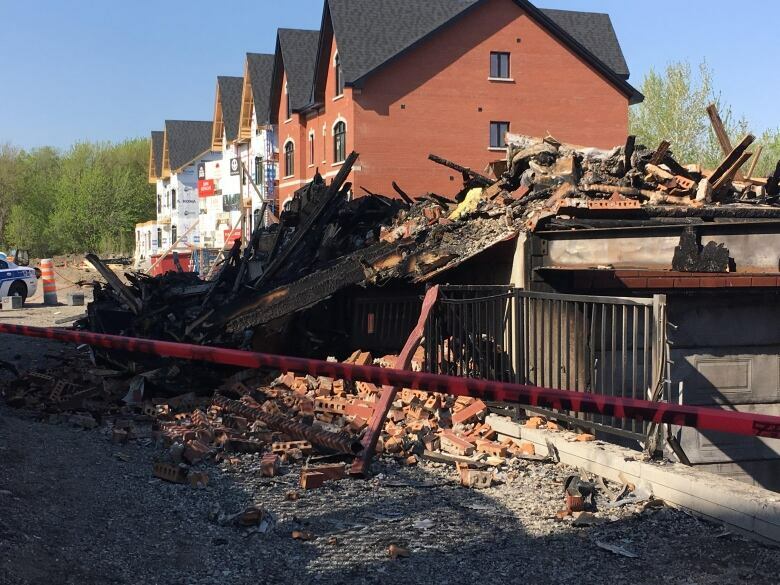 Montreal police say a five-alarm fire at a LaSalle townhouse Tuesday night which left one person dead was intentionally set, and they're now investigating a homicide. Montreal police say a five-alarm fire at a LaSalle townhouse Tuesday night which left one person dead was intentionally set, and they're now treating the death as a homicide. The victim is presumably a 61-year-old woman who was reported missing by a family member after the building was evacuated during the fire. The fire started in the backyard of the building on Bois-des-Caryers Street and spread quickly — it went from a one-alarm to a five-alarm fire in the span of 30 minutes. Firefighters discovered a body in the debris just before 6 a.m. Wednesday. Police believe the body is that of the missing woman, though it hasn't been formally identified, said Montreal police Const. Benoit Boisselle. Witnesses reported seeing at least three people running from the scene, Boisselle said. The Montreal police major crimes unit and the arson squad are handling the investigation. Three homes were destroyed, and a fourth was heavily damaged. Firefighters estimate the fire caused about $2 million in damage. About 160 firefighters were called in to fight the fire.